Available the videos of the Opening panel of experts and live presentations from the 2013 Virtual Best Practices Showcase. From left to right panelists experts: Dr. José J. Rivera, President, USC; Mr. René Sainz, Director, UTB; Ms. Bo Zigner, Director, KU and moderator Mr. Manuel J. Fernós, HETS Chairmand and President, IAUPR. 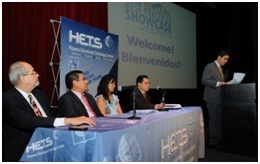 For the benefit of those who didn’t attended face to face, or through the live webcast, we invite you to access the event recording, free of charge at the following link: Opening Session of the HETS Virtual Best Practices Showcase. In addition to the Opening panel of experts, you can also watch the recorded sessions of the presentations that were transmitted live during the first week of the event. Just visit our blog HETS Updates/Al Día in our webpage to access all recorded sessions. You still have time to register free of charge to the Virtual Best Practices Showcase that will be held until February 8, 2013. This event is intended to celebrate Innovation in Retention and Assessment in Distance Learning Education, Equivalence and Authentication to Promote Hispanic Student Success in Higher Education. HETS is delighted to invite your faculty members, instructional designers, student support staff, distance learning personnel, and other academic and support leaders to participate and learn from more than 15 ground-breaking practices. Non members participants are also invited to join us and register for only $50.00. Registration it’s easy an online! To register for this online event go to: VBPS registration. After registration, you will receive a confirmation message, followed by a communication from our office, with your code to the HETS platform to access the presentations, which is a combination of live and recorded ones. This Virtual Best Practices Showcase is proposed to take place every other year to alternate with the face to face version. This combination of virtual and face to face Best Practices Showcases will provide a continuous space for HETS member institutions sharing their expertise in dealing with the Hispanic population and finding ways to provide them with opportunities to succeed. Moreover, participants will be not only able to learn from the showcased works, but also find solutions to many common issues and even establish new possibilities for collaboration with other institutions and potential partners. For more details, visit Virtual Best Practices Showcase.